Every year my husband and I get a 1/4 beef from a Foggy Dale Farms, a local farm to us. Aside from all the delicious steaks and what not, we get several roasts as well. I have to admit that I often fall into the Crock Pot Roast rut. Though delicious, it can get a little boring. 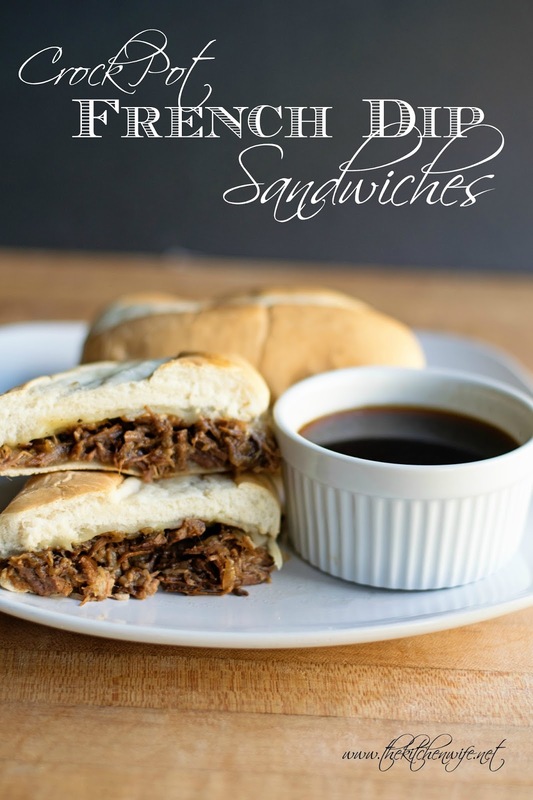 I was sharing this with a friend the other day, and she shared with me how she makes these lovely Crock Pot French Dip Sandwiches. To begin, you will need to season the chuck roast, liberally, with salt and pepper. Place it into the bottom of the slow cooker. Now add a little oil to a pan, and place it over medium/high heat. Once the pan is hot, brown the roast on all sides for 2-3 minutes per side. After you have browned the chuck roast, place it on top of the onions in the crock pot. To the hot pan pour in one can of the beef consommé. Using a wooden spoon scrap up all of the brown bits from the bottom of the pan. Pour the beef consommé and brown bits from the pan over the chuck roast in the slow cooker. Now pour the second can of beef consommé into the crock pot. Now add the beef bouillon. Then place the lid on your slow cooker and turn the heat to LOW. I know you are accustomed to having EVERY step by step photo, but for some reason I quit taking pics from here on it, but here are the directions for the rest of the recipe. After the beef chuck roast has cooked in the crock pot for 8 hours, remove it from the sauce and place it on a baking sheet. Using two forks, shred the roast. 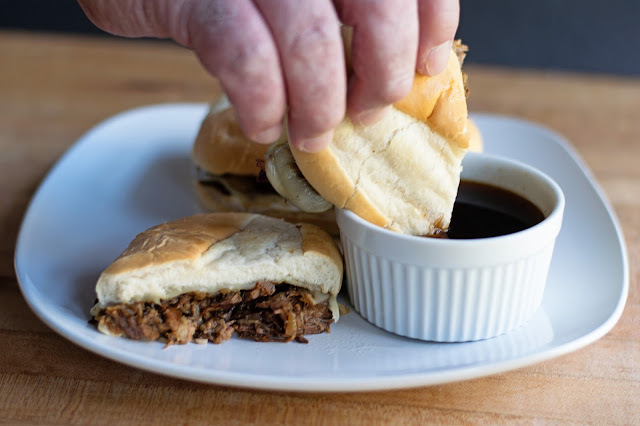 Skim the fat from the top of the au jus sauce. Pour it into a sauce pan and bring to a simmer. Simmer for 10 minutes. Place the bottom half of the hoagie bun on a baking sheet. Place some of the shredded beef on the bottom half of the bun. Place two pieces of the provolone on top of the shredded beef. Place the top half of the bun, on the baking sheet, beside the bottom half with the meat on cheese. Remove from the oven, place the top half on the bottom, and serve the au jus sauce in a little dish on the side. 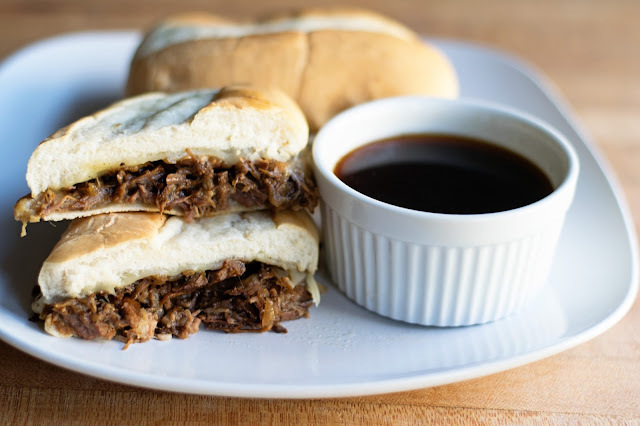 These Crock Pot French Dip Sandwiched are absolutely mouthwatering. The flavor is so rich and bold. The beef is wonderfully tender, it literally melts in your mouth. So the next time you get a lovely chuck roast on sale, and want to change it up a bit, give these amazing Crock Pot French Dip Sandwiches a try! You are going to love them. Season the chuck roast, liberally, with salt and pepper. Slice the onion and place it in the bottom of the crock pot. Place a little oil into a pan and place it over medium/high heat. Once the pan is hot brown the chuck roast on all sides for 2-3 minutes. Once the beef is browned place it in the crock pot, on top of the onions. Pour one can of the beef consommé into the hot pan and scrape up the brown bits from the bottom of the pan. Pour the beef consommé and brown bits over the chuck roast. Pour the second can of beef consommé into the crock pot along with the root beer, soy sauce, garlic powder, onion powder, beef bouillon, thyme, bay leaf, and pepper. Place the lid on the crock pot and turn it on LOW. After the roast has cooked for 8 hours, preheat the oven to 350 degrees. Remove the roast from the sauce and place it on a baking sheet. This is in the crock pot right now. What brand of root beer did you use? It looks like not your father's. I did barqs, but I bet the alcohol from nyfrb would do wonders on the roast. It's finished. And devoured. So good. The au jus was amazing. Better than johnnys.